Designed and equipped specifically for seed implantation procedures, the 3D Brachytherapy C-Arm Table features motorized actuation of height, X-Y, lateral roll and Trendelenburg motions of the tabletop. 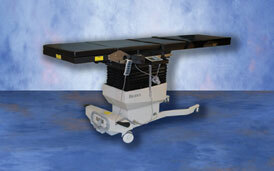 The narrow, low-attenuation carbon fiber tabletop is cantilevered to accommodate portable 3D C-Arms. The functional design provides complete access with minimal radiation exposure to clinicians. 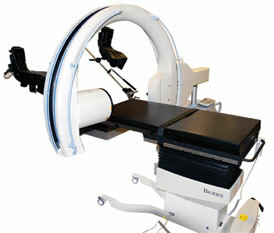 The table comes equipped with a non-imaging extension and a radiolucent extension. A standard OR accessory rail located at the foot end of the table makes stepper positioning quick and easy. Whether you select knee crutches or the PAL Stirrups, standard or Dura Board arm boards, the choice is yours. Biodex lets you configure the table accessories to your exact specifications. Both AC and battery power are standard. For continuous cordless operation, a separate battery charging unit and second battery will keep you charging and functioning around the clock. As required by law, all Biodex C-Arm tables are CDRH registered and FDA Device Listed. 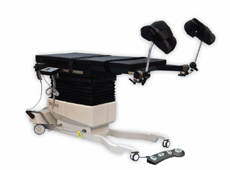 All motorized tables are ETL product listed to the UL-60601-1 Medical Electrical Equipment Safety Standard. The rail-mounted main control panel, portable hand-held controller, and foot-operated controller can be positioned for convenient access from any point around the table. The main panel with backlit liquid crystal display mounts on either accessory rail. The LCD screen displays actual tabletop position (all axes) in real time, and provides menus and prompts for other functions. Up to ten position sets may be stored in system memory, and recalled at any time for automatic positioning. A "Level" button brings the table to 0° tilt and 0° lateral roll. "Home" levels the table and lowers the tabletop to minimum height for patient transfer. Control buttons are identified with easily recognizable icons. The portable hand-held and foot-operated controllers offer the freedom to adjust height, lateral roll, X-Y and Trendelenburg motions from positions away from the main panel, or when hands are busy with other functions. The hand-held controller hangs on an accessory rail when not in use. The joystick controller for motorized X-Y positioning offers intuitive positioning with proportional speed control. After setting an adjustable icon indicator on the joystick's base, X-Y motion correlates directionally to actual tabletop motion. To prevent undesired motion by accidental contact with the joystick, a thumb button on top of the joystick must be pressed for activation.